Background Studies from different fields documenting the differences between clinicians’ and workers’ representations have not elucidated where the differences exist or how they can be resolved. Purpose To define and describe scenarios depicting the differences between clinical judgment, workers’ representations about their disability and clinicians’ interpretations of these representations. Methods A multiple case-study design was used. Semi-structured prospective interviews were conducted at four points in time, with five clinicians managing 12 cases of workers having persistent pain and participating in an evidence-based work rehabilitation program. Results Four scenarios depicting differences in representations were found, but not all the differences necessarily had a negative impact on the program outcomes. For the clinicians, clear identification of the problem was important to allow for the use of concrete, pragmatic strategies. For the workers, congruence between the proposed strategy and their representations was crucial. Conclusion During rehabilitation, the objectives must be acceptable to both parties or the proposed strategy must, at least, make sense to the patient. This study was made possible through the participation of workers on long-term absences from work. Their commitment to the project was demonstrated on more than one occasion by their ready availability for the interviews. Their generosity in sharing their viewpoints cast a new light on the work rehabilitation process. We also wish to offer our warmest thanks to the members of the interdisciplinary work-rehabilitation team involved for their availability and generosity in sharing their experience in this project. This study was supported by a joint grant from the Quebec Rehabilitation Research Network (a thematic network of the Fonds de Recherche en Santé du Québec) and the Institut de recherche Robert-Sauvé en santé et en sécurité au travail (IRSST). The first and third authors are supported by salary awards from the Fonds de Recherche en Santé du Québec. Coutu MF, Légaré F, Durand MJ, Corbière M, Stacey D, Loisel P et al. 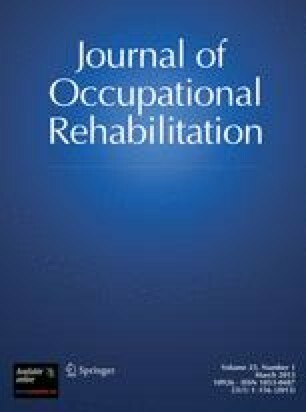 Fostering shared decision making by occupational therapists and workers involved in accidents resulting in persistent musculoskeletal disorders: a study protocol. Implement Sci. 2011;6(22). doi: 10.1186/1748-5908-6-22.